Gelato is the Italian counterpart of ice cream, often considered to be a healthier version. It is creamy, light, and has a smooth, silky texture. It contains more milk than regular ice cream which makes it denser and gives it an intense taste. It is available in many refreshing flavours and is becoming a favourite cold treat among people as it is better than ice cream in both taste and nutritional value. This is why many ice cream shops also include gelato on their menu. Gelato is refreshing, flavourful, and creamy. Since it contains more milk than cream, it is an excellent choice for health-conscious people as well. This is why it is a double dose of happiness for both adults and children. Gelato is a healthier dessert option as it contains fewer calories compared to regular ice cream. A typical vanilla flavoured scoop of gelato contains only 90 calories. Even if you are on a diet, you can consider having gelato when you are craving something sweet, cold and refreshing. Butterfat, popularly known as milk fat, is made of around 400 fatty acids. Gelato is made using water or milk instead of cream, resulting in a lesser content of butterfat. A regular scoop of gelato contains only about 4% – 8% butterfat, making it a healthier choice. Since gelato has fewer fats than traditional ice creams, it is available in more enhanced flavours. This is why gelatos have a more powerful taste as compared to other cold treats. In addition to containing fewer calories and fats, gelato also has many vitamins, such as Vitamin A and Vitamin C depending on the ingredients used for different flavours. As milk is one of them, it is also rich in calcium. Gelato contains a high amount of protein which is why it is an excellent option for athletes, especially those on a strict diet. It allows them to have a healthy indulgence without compromising their nutritional intake. 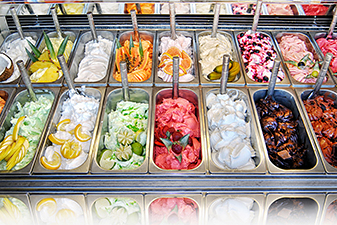 Gelato can be customized according to the needs and preferences of the customers. Since people are inclined towards eating healthy, many gelato shops also offer other wellness options including sugar-free and lactose-free gelato ice creams. If you are looking for a healthy dessert option, Crepe Delicious is just the place for you. 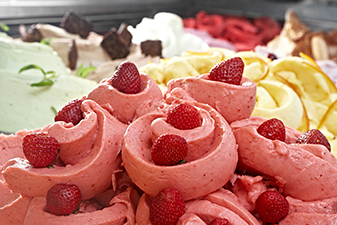 We have many refreshing flavours of gelato inspired by the desire to create unique and delightful dessert choices. We strive to create an enjoyable experience by serving flavourful gelato to our customers. We also have sugar-free and lactose-free options along with a selection of sorbets that contain 0% fats. If you are craving something refreshing and healthy, visit the nearest location and try our gelato flavours. We also specialize in delicious sweet and savoury crepes.